Delivering resistance-free parallel offsetting in a compact space, the Schmidt-Kupplung range may be just what you're looking for. Wherever driven equipment is required to be axially displaced during operation, problems tend to arise. This is usually because the displacement can be disproportionate to the distance between shaft ends (DBSE). The consequence of this is often that, using conventional shaft couplings, it becomes impossible to transmit loads through a large parallel shaft offset without increasing the distance between shaft ends. Clearly, this has the effect of increasing the machine's footprint, which is not an acceptable outcome in most instances. In addition, other coupling designs may suffer from a degradation of torque capacity and increased backlash during operation when required to accommodate such a high degree of parallel offset. What is needed, therefore, is something that can accommodate a large parallel or radial offset without resistance to offsetting. Any other coupling - gear, disc, membrane, u-joint elastomeric - has an inbuilt resistance to offsetting in parallel. Traditionally, there are many types of flexible couplings that can accommodate a parallel offset, but they all involve there being a considerable distance between the driven and the driver, meaning a great deal of space is taken up. Fortunately, a viable alternative to this problem does exist in the form of the Schmidt-Kupplung range of shaft couplings offered by Abssac. This product has no resistance to offsetting at all- which is a great benefit to the user. At the same time, however, it also has the ability to transmit an extremely high amount of torque. The Schmidt-Kupplung allows for exceptional radial movement while reliably transmitting backlash-free torque. Torque is transmitted via compression and tension of the coupling lever links. This well-balanced system transmits torque without adding side loads to the drive. Moreover, the Schmidt-Kupplung will not transmit radial vibration from the drive to the driven shaft. Most importantly, the Schmidt-Kupplung delivers all these advantages in an extremely compact design. For example it is possible to have a parallel shaft offset of 275mm in an overall length of 284mm. A classic design for extreme parallel offset, the Schmidt-Kupplung is a compact. 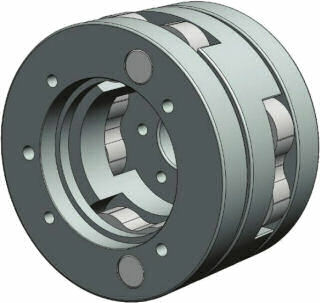 torsionally stiff performance shaft coupling that compensates for variable parallel shaft offset during operation. The Schmidt-Kupplung is the ideal precision component for shaft connection in confined spaces. Through its modular construction both torque transmission and radial offset capacity can be optimised for each application. The well-balanced design means that the Schmidt-Kupplung is used in many applications, in fact the design can be used in any transmission design where high torque, high shaft offset and small DBSE is present. The precision coupling transmits torque under constant velocity at all possible offsets and can transmit torque ranges from 35 Nm to 6610 Nm. 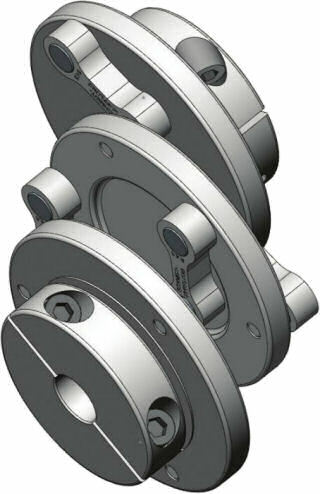 The couplings are able to transmit huge amounts of torque because the central disc is always defined. Indeed, it is a mechanical guarantee is that the centre disc finds its location and is always in the same place when the device is offset. Many engineers may not realise that such a large parallel offset can be achieved by a shaft coupling. And, in one sense, this is not surprising, since there aren't any other couplings in the world that handle close shaft coupling and large parallel offset. Crucially, these couplings are also customisable. The links can be longer, meaning you can start to customise their higher torque capacity and thereby extend the amount of parallel offset it is possible to accommodate. Typical applications for the SchmidtKupplung range include printing machines, roll forming machines, laminating machines and corrugated paper and papermaking machines. Of these, however, printing makes up the largest area of application. One reason for this is that shaft couplings for the printing industry are required to work with absolute precision to guarantee a register pressure and therefore ensure a high print quality. The high precision requirement starts in the actual printing mechanism and continues through the refinement process to quality assurance on the final product. To maintain the precision movement, the Schmidt-Kupplung range of shaft couplings are found in many areas of the printing processes. For example, in the drives for printing mechanisms the couplings can be found driving ink rollers and duct rollers or in the drives for rotary die cutting machines and cutting rollers they can be found where guaranteed precise stamping or cutting processes are performed. A particular advantage of the Schmidt Kupplung is that during the printing operation, individual rollers may also need to be adjusted, replaced or even removed from the machine. Ease of connection and the unique properties of the Schmidt Kupplung design allow for the axial displacement of roller holders up and away from the press so that maintenance or roller change can be carried out. Crucially, this means that there is no need to stop the printing machines during this period. The Schmidt -Kupplung is available in three basic series for various performance levels (Standard; Power Plus and Offset Plus). There are three different shaft-hub connections available: a taper lock, standard bore or flange mount.